Many writers have been called timeless, but Walt Whitman deserves this description in a special way. He invented himself in 1855 with a slim volume of poetry, 'Leaves of Grass,' that seemed to have come from nowhere and connected to nothing else that was being written at that time or any other. The poems were about himself, plain and simple, especially the ecstatic 'Song Of Myself,' which celebrated the explosive joy of living inside a human body. The poems were as sexually frank as diary entries, and the rhythms of the words took 'free verse' to a new threshold; it was as if meter and rhyme had never existed. Walter Whitman (he chose to become 'Walt' when he became a writer) was born of Quaker parentage on May 31, 1819 in West Hills near Huntington, Long Island. He was taught in various Long Island schools and worked for several newspapers, including the Brooklyn Eagle. He published some of his writings, but by his mid-thirties had still not displayed the slightest hint of his unique talent and vision. He published 'Leaves of Grass' himself in 1855. He mailed a copy to Ralph Waldo Emerson, who immediately recognized the book's unusual worth and wrote Whitman a letter with the famous line so many writers have since wished to hear: "I greet you at the beginning of a great career." 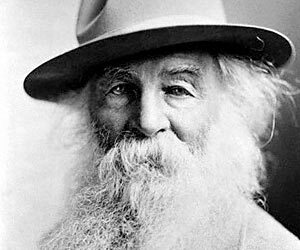 Whitman died on March 26, 1892 in Camden, New Jersey. In Huntington, Long Island, Walt Whitman is memorialized by a huge shopping mall where teenagers shop for shirts and mothers lug screaming babies through the echoing halls, the immortal words of the Good Gray Poet on the minds of each and every one. I did a photo essay at this mall, which you can see here as part of my web project, Queensboro Ballads. You can also read more about Whitman and his parallels with the Beat Generation here. No Responses to "Walt Whitman"